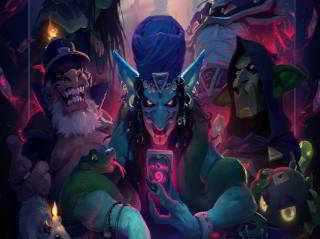 On March 14, 2019, Blizzard announced a new expansion for Hearthstone. 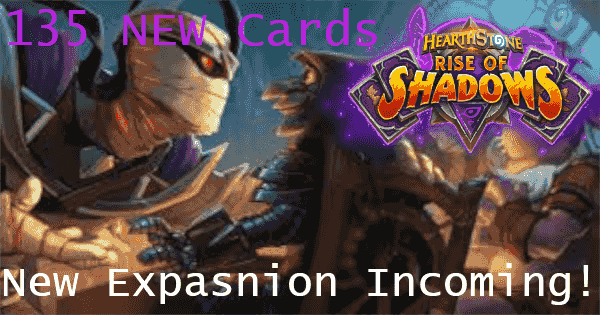 Rise of Shadows will be released with 135 new cards on Tuesday April 9. This will be the first expansion for Hearthstone's Year of the Dragon. The theme for Rise of Shadows revolves around the League of E.V.I.L. 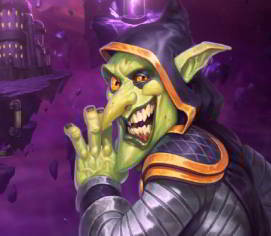 : a collaboration of the villains throughout Hearthstone lore who team up and attempt to cause chaos. The members of this League of E.V.I.L. are Rafaam, Dr. Boom, Hagatha the Witch, King Togwaggle, and Madame Lazul. 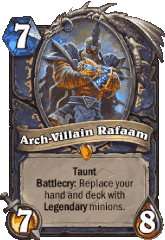 Rafaam is a Hearthstone original character. He is known to be an ethereal. According to World of Warcraft lore, ethereals are collectors of lucrative items and artifacts. It is said that Rafaam travels across different worlds in search of powerful artifacts. In-game it is shown that he is in possession of three powerful artifacts: the Lantern of Power, Timepiece of Horror, and Mirror of Doom. Ethereals are also known to be chaotic neutral in WoW lore. With that being said, Rafaam's grand scheme is still a mystery. 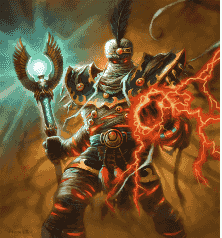 Rafaam first appeared as a villain in the third adventure, called The League of Explorers. In his debut, he was the second-to-last and last boss in the fourth wing. The first encounter was quite a treat for many. At the beginning of the boss battle against Rafaam, he would steal the player's deck and use it for his own. Defeating Rafaam would reward you with the card Arch-Thief Rafaam. It was available to play in the standard format up until the beginning of 2017. Originating in World of Warcraft lore, Dr. Boom resides in an area called Netherstorm. Originally, he was known as Sparky Uberthruster, but due to constant exposure to the Netherstorm, he transformed into Dr. Boom. Now he is known as an evil scientist still residing in the Netherstorm, conducting experiments, inventing mechs, and wreaking havoc upon those who are unfortunate enough to be in his presence. Dr. Boom saw his debut in Hearthstone as a legendary class card in the Goblins vs Gnomes expansion released in 2014. His ability to command and summon Boom Bots is portrayed in this version of his card. Although his first card iteration is rotated out in standard mode, there is a good chance we'll see more of Dr. Boom in later expansions. Hagatha is a witch who stays deep in a dark forest known as the Blackwald. Known to command and twist the trees to her will and to conjure dark magic, Hagatha torments the residents of Gilneas who are, to their dismay, located just north of the dark forest. No one knows where she came or her true intentions. For now, Hagatha preys on the poor souls that happen to stumble into her domain. 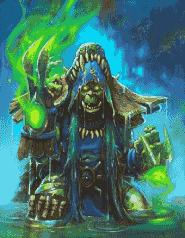 Hagatha the Witch is a playable Shaman class hero card. Once played, her wicked presence is immediately known through her battlecry: “Deal 3 damage to all minions” – with no concern as to who is caught within her torment. Her conjuring is displayed through her hero power Bewitch. With this hero power, you are given a random shaman spell to your hand after you play a minion. She also makes an appearance as the final boss in the single player adventure mode. Hagatha the Witch will still be playable during the next expansion and will be represented primarily in the Shaman class. The ruler over the cowardly race of kobolds, King Togwaggle is also a kobold himself. What makes him stick out above the rest is wielding a fire elemental known as Rakanishu. 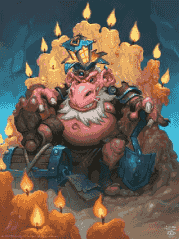 King Togwaggle resides in a network of underground tunnels where his subjects scavenge for treasure dropped by or stolen from weary adventurers. King Togwaggle is featured as a final boss in the single player campaign, Dungeon Run. 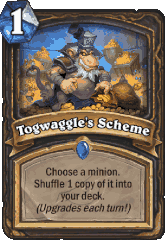 Like most of the villains, King Togwaggle is represented as a playable neutral card. His thieving nature is demonstrated by his card effect. Once summoned, he forces the players to swap decks with each other. The player who didn't play King Togwaggle will receive a Kings Ransom card shuffled into their deck. Upon drawing the Kings Ransom, a player who wants to swap back decks can play the card (and fork over 5 mana) to do so. King Togwaggle appeared during the Kobolds & Catacombs expansion and will see itself out of standard format once the Year of the Dragon arrives. Not much is known about Madame Lazul. She made a character appearance during the Whispers of the Old Gods expansion. We will likely see more representation of Madame Lazul during the Rise of Shadows expansion through spell cards and possibly her very own hero card as well. So far, this mechanic has only been revealed for the Rogue class. It seems that this keyword will be found in classes that represent the villains of this expansion. Lackeys are 1 cost minions that offer different effects when played. There are five different types, one for each villain in League of E.V.I.L. Revealed in the Druid class, this mechanic is potentially used by the “good guys” or Defenders of Dalaran. Twinspell gives you a copy of the card that contains the “Twinspell” text for the same mana cost. So far there is only one card revealed to have this effect, but there is still time from now until the expansion's release to see more of what this keyword has to offer. Though the majority of the cards in Rise of Shadows remain mysterious, we were teased some info on a small portion of what's in store. Blizzard will continue to reveal a few cards slowly during the lead-up to the April 9 release date. A 0 mana cost spell card that states: “Spend all your Mana. Destroy a Minion with that much Attack or less.” Sporting an image of Madame Lazul, this is a Priest card that gives decent single-target removal for the class. 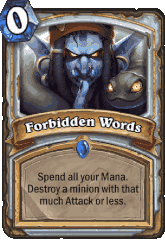 Forbidden Words also relieves the known and longstanding weakness of Priest not being able to deal with 4 attack minions using single-target removal. 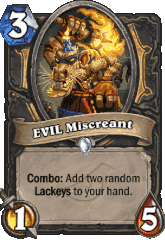 Displaying one of the new card mechanics, Lackey, EVIL Miscreant is a Rogue class card that states: “Combo: Add two random Lackeys to your hand.” Lackeys are 1 mana cost minions that have their own unique effects. Each lackey has an effect representing a villain involved in the League of E.V.I.L. EVIL Miscreant is a card that offers great tempo and value, giving the opportunity for Rogue to build a deck revolving around these effects. This is a card that may see play more in control-oriented Warlock decks. It won't see much success in aggressive-type decks in this class due to their fast-paced nature. Warlock has seen a similar effect through a spell card called Renounce Darkness, which replaces your Warlock class cards in hand and deck with cards that belong to another class. A 5 mana Shaman spell, it reads: “Deal 1 damage to all minions (upgrades each turn! )” The upgrade part of the card becomes really powerful if you happen to catch this card at the beginning of the game. Each turn that this is in your hand, the damage dealt to all minions is increased by 1. Also staying true to Hagatha, Hagatha's Scheme does damage to all minions. This includes your own, so be wary on the timing of when you want to use this card. 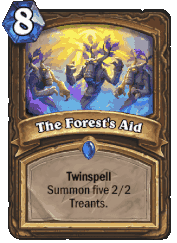 A card sporting the new mechanic Twinspell, The Forest's Aid reads: “Twinspell, Summon five 2/2 Treants.” This 8 mana Druid spell allows you to nearly fill the board in an instant. Despite its expensive cost, there's potential for you to play this card on earlier turns due to cards like Wild Growth and Nourish. By ramping more mana on earlier turns, you could potentially overwhelm your opponent with five minions with the opportunity to double this effect thanks to Twinspell. This is a Rogue class card with great combo potential. It states: “Choose a minion. Shuffle 1 copy of it into your deck. (upgrades each turn! 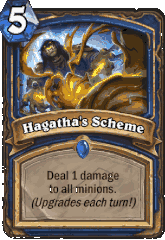 )” Togwaggle's Scheme has a similar flavor to Hagatha's Scheme with the upgrade mechanic although this one is a bit more flexible. This 1 mana cost card has great synergy with Rogue's Thief deck where you're constantly gaining access to cards within your opponent's class while doubling down with Academic Espionage or Tess Greymane. 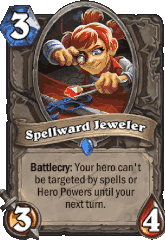 Spellward Jeweler is a neutral class card (playable in all classes) that reads: “Battlecry: Your hero can't be targeted by spells or Hero Powers until your next turn.” This card is a great tech or disrupter for combo decks that usually strike you down with spells. Although you're only safe for one turn, this may buy you enough time to survive and pull off a combo of your own. Even if the matchup doesn't call for such a combo disrupter, this minion is pretty well-statted for a 3 cost card that offers decent board presence if needed. A powerful mage class card that belongs to the dragon tribe, this card says: “Your first spell each turn costs (0). 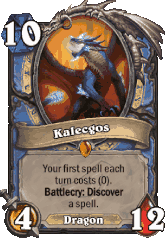 Battlecry: Discover a spell.” Kalecgos is the first dragon to be revealed so far in this expansion. It offers the potential for a great swing turn late game. This 10 mana dragon allows you to pull a board clear, if needed, to take back the board or a damaging spell to close out the game. If you're lucky enough for this minion to stick to the board, you're able to play your first spell of each turn for 0 mana. There haven't been any Mage spells to be revealed for this expansion so far, but there are cards like Flamestrike and Pyroblast that offer great synergy with Kalecgos. This neutral class card appears to be unorthodox compared to the previous cards that have been revealed. 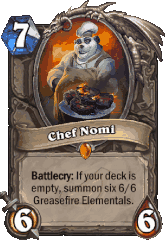 Chef Nomi reads: “If your deck is empty, summon six 6/6 Greasefire Elementals.” It does have a steep requirement of having no more cards in your deck for what the payoff is. Once you're deck-less, you enter fatigue, taking accumulative damage each time you would draw a card, so the clock is on. Chef Nomi is a good candidate for being able to close out long and grueling games against control-type decks. There are many new and exciting aspects planned for the Year of the Dragon, such as the Hearthstone Masters Tour. As the first expansion of 2019, Rise of Shadows will set the tone for the rest of the year. Baku the Mooneater and Genn Greymane will see themselves out in the next standard rotation. This gives more freedom for card designers to concoct new cards without the worry of taking into account odd and even cost cards. We look forward to the Rise of Shadows expansion and what will follow after. If you enjoy the card-based strategic competition offered by Hearthstone, then maybe you would also appreciate the deep subtlety involved in successful poker play. Just as Hearthstone is, poker is mainly an online endeavor these days. You can learn about your options for getting into the game with our online poker guide for US players.